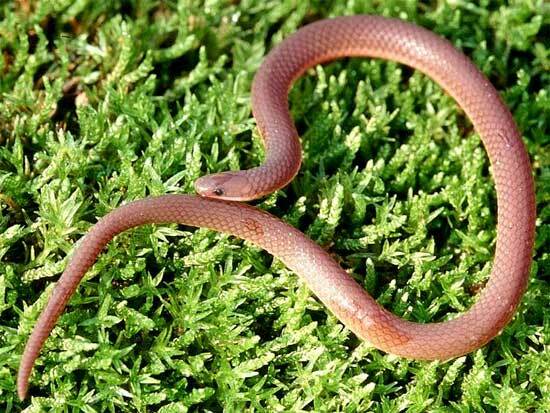 The worm snake is found in moist environments throughout Virginia below 1300 meters elevation. It occurs statewide in Virginia except for the barrier islands of the Eastern Shore. This species is common in all areas of Virginia with developed soils. It is secretive and occurs in forested and wooded habitats where the soil allows burrowing. It has been found under all manner of surface objects, including logs, tree bark, boards, rocks, and trash, as well as in moist logs and stumps. 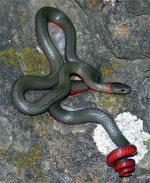 This snake is seldom found active on the surface and is only rarely seen crossing paved roads at night. The worm snake truly resembles a worm. It has a length of 7.5-11 in. (19-28 cm), the head is plain brown above, the belly is pink, and the head is pointed. The scales are smooth and opalescent. The young are darker than the adults. The upper side of the body and head are unpatterned and plain brown; the underside is unpatterned and pink, with pink coloration extending onto the sides of the body. At hatching, juveniles are patterned as adults but the dorsum is a darker brown and the venter is bright pink. Eggs, 2-8, are laid in June or July and hatch in late summer. When held in the hand, this snake attempts to push its way between the fingers with both its tail and head. The primary prey of the worm snake is worms, but it will also take soft-bodied insects.